AB-1000 and ABP-1000 Wet Niche Potting Compound Our Aqua blue, UL-Listed potting compound, required by National Electrical Code for encapsulating the ground connection in swimming pool and spa wet niches for underwater lighting. AE-2200-250 Anchoring Epoxy Specially formulated, light gray epoxy for anchoring threaded rod, bolts and rebar into concrete. CR-2000 and 2000-400 Self-Leveling Epoxy Gray, self-leveling, thick-syrup-like epoxy for concrete repair and other general-purpose uses in horizontal applications. CR-2100 and CR-2100-400 Non-Sag Epoxy Gray, non-sag, toothpaste-like epoxy for concrete repair, mounting things on vertical surfaces, and other general-purpose uses. Stays put on vertical surfaces. SR-3000 and SRX-3000-400 Structural Repair Adhesive White, high-strength bonding. Bonds well to dissimilar materials. Hardens in 5 minutes for fast repairs! UW-5000, UW-5000-400 Off-White, and UW-5200 Gray, Underwater Repair Adhesives Can be mixed and applied underwater - no need to drain the pool! Sticks to just about anything, wet, dry or underwater. Bonds dissimilar materials. Strong, permanent bond with a little flexibility once cured. ABC-9100-300 clear, and ABW-9000-300 white, Waterproof Gap and Seam Filler Sealants Very high quality, clear or white, waterproof sealers and gap fillers. Perfect for expansion joints and other gaps around the swimming pool area and components. Can fill up to 1/2" gap. And our clear version STAYS CLEAR! 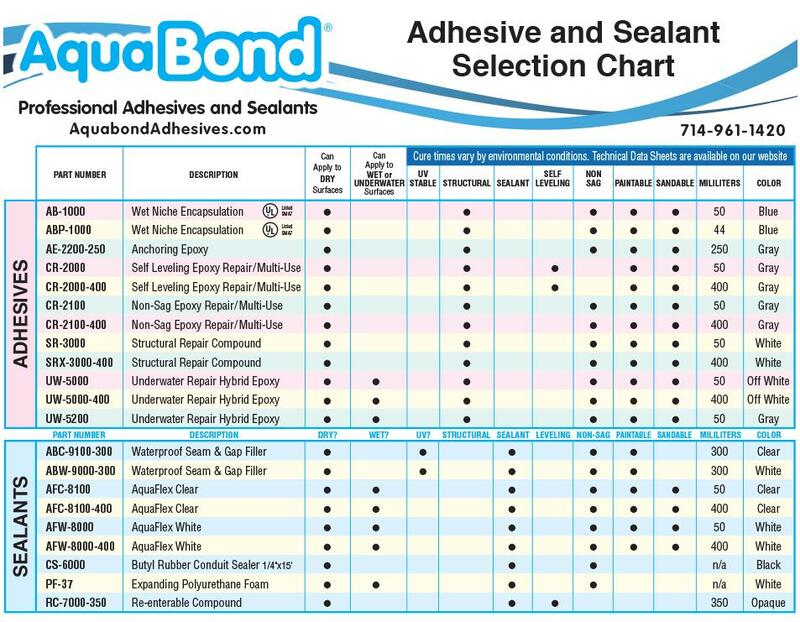 AquaFlex AFC-8100 and AFC-8100-400 Clear Underwater Sealant Spreads like warm butter! Designed to be applied underwater. Specially formulated for sealing hairline, thin and spider crack leaks. Not UV stabilized. Must be over-coated when applied above water to prevent discoloration. Should be applied using our patent-pending Polyethylene (PE) Film method. AquaFlex AFW-8000 and AFW-8000-400 White Underwater Sealant Spreads like warm butter! Designed to be applied underwater. Specially formulated for sealing hairline, thin and spider crack leaks. Not UV stablized. Must be over-coated when applied above water to prevent discoloration. Should be applied using our patent-pending Polyethylene (PE) Film method. CS-6000 Black Butyl Rubber Tape Conduit and Joint Sealer 1/4" wide x 15' long roll. Stays flexible in extreme weather conditions from -40°F to 180°F. You'll find many other uses for this sticky, very flexible black tape. Must be applied when surfaces are dry. PF-377 Polyurethane Foam Injection Kit. This pro-quality, white foam injects and expands to a permanent, water tight seal - through the entire thickness of a concrete pool or foundation wall. Plugs serious, structural cracks and stops leaks. RC-7000-350 Re-Enterable Electrical Insulating Resin Self leveling, liquid, rubber-like potting sealant for totally encapsulating the electrical connections in a horizontally oriented junction box. Cures to a consistency of very firm gelatin. Can be "re-entered" for future electrical work. Generally used for fountains. Pre-Outfitted Carry Cases A premium-quality, molded case with die-cut foam liner to protect and organize your AquaBond 50ml adhesive and sealant cartridges and static mixers. Available in several configurations, the cases are pre-loaded with 5 cartridges of adhesives and or sealant, our durable DM-50 Dispensing Gun and twenty SM-5416 static mixers. Starter Kits Available for many of our adhesives and sealants. Kits include heavy-duty AquaBond dispensing gun, one cartridge of the adhesive or sealant and a supply of static mixers. Start with the kit, then purchase additional cartridges and static mixers as needed. Dispenser Guns Five models for dispensing AquaBond sealants and adhesives in our various volumes. DM-50 for our 50ml system, and DM-250 for our 250ml and 300ml systems. Our 400ml systems offer three dispenser options: the manually operated DM-400, the amazingly powerful Pneumatic DP-400 and our new Cordless Rechargeable DA-400. Static Mixers Small plastic tubes that mount to the outlet of the adhesive cartridge, then automatically and precisely mix the adhesive or sealant. The adhesives are 2-part (resin plus hardener) when they are in the cartridge, but are mixed and ready to apply when they exit the nozzle of the mixer tip. The Static mixer also makes it easy to land the adhesive exactly where you want it! The nozzle tip can be trimmed to allow for a larger bead size. AquaStitch Mechanical Staples Stabilize structural cracks in gunite, shotcrete, concrete and fiberglass pools.